Among the original machines described in the corpus of Islamic technology, the six-cylinder "monobloc" piston pump designed by Taqi al-Din Ibn Ma'ruf in the late 16th century holds a special place. Working as a suction pump, this complex machine included components that are often associated with modern technology, such as a camshaft, a cylinder block, pistons, and non-return valves. In this article, Joseph Vera, an expert in re-engineering ancient inventions, describes how he created a SolidWorks CAD model of this remarkable pump, that he completed with a motion simulation. The conclusion he drew after creating the model and the simulation is that the engineers of the Islamic tradition, represented by Taqi al-Din, had a very solid grasp of kinematics, dynamics and fluid mechanics. He notes also that Taqi al-Din's "monobloc" pump is a remarkable example of a machine using renewable energy, a topic that is currently of utmost importance. One day, while browsing at a local library, a fascinating book caught my eye. The book was Islamic Technology: An illustrated history by Ahmad Y. al-Hassan and Donald R. Hill, which explores the engineering achievements of the Islamic Golden Age, a topic that sadly had previously been neglected. One particular achievement mentioned in this book drew my attention: Taqi al-Din's six-cylinder "monobloc" piston pump. Although this pump was designed in the 16th century it included components that are often associated with modern technology, such as: a camshaft, a cylinder block, pistons, non-return valves, and further to this it worked as a suction pump. However, it is important to note that this machine was created approximately two centuries before the dawn of the Industrial Revolution. 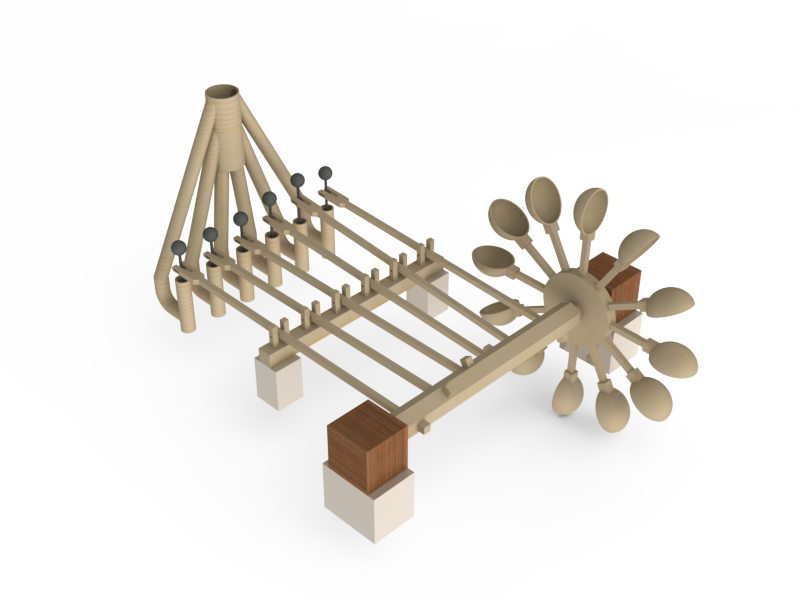 For quite some time the subject of Industrial Archaeology, more specifically re-engineering ancient inventions, has been one of my main interests, and it occurred to me that creating a SolidWorks CAD model of this remarkable pump and to complete it with a motion simulation would help broaden our understanding of engineering during the Islamic Golden Age. After creating the model and the simulation, it is my belief that the engineers of this era had a very solid grasp of kinematics, dynamics and fluid mechanics. This paper describes how the "monobloc" pump was modeled and the steps required for creating a successful motion simulation. Below is a rendered image of this ingenious invention (fig. 1). Figure 1: Taqi al-Din's "monobloc" pump, SolidWorks model rendered in PhotoView 360. © Joseph Vera. The dimensional and design information we used came from two excellent sources: the book Islamic Technology – An illustrated history by Ahmad Y. al-Hassan and Donald R. Hill, and the article by Salim T S Al-Hassani and Mohammed A. Al-Lawati The Six-Cylinder Water Pump of Taqi al-Din: Its Mathematics, Operation and Virtual Design, published online on the academic web portal of FSTC www.MuslimHeritage.com. In cases where there was no detailed design information we chose dimensions that made the model strong enough to withstand the loads, and also we ensured that the model was manufacturable using technology that was available in the 16th century. The design intent of this pump is to elevate a certain quantity of water to a specified height using the energy from a nearby river. The water is pumped via suction pipes into delivery pipes and finally into an elevated collective pipe. These pipes are connected together and make up one component, which is known as the cylinder block. We started by modeling the cylinder block, since it is a key component in the design of the entire pump. In fact, the dimensions of the cylinder block will then determine the dimensions and the layout of the pistons, the levers, the pivots, the camshaft and the waterwheel. One of the challenges we faced in modeling the cylinder block was to ensure that the pipes are connected in such a way that there were no interferences or areas with small thicknesses that would make fabrication impossible. To achieve this, we added small clearances so that the pipes had enough spacing between them. Naturally, this is relatively simple to do with SolidWorks. However, Taqi al-Din and the engineers of the Islamic Golden age obviously did not use CAD software, which means that they must have had a great understanding of geometry and tolerances to create the cylinder block. Below is a drawing of the cylinder block showing some of the clearances (fig.2). Figure 2: Sample clearances in the cylinder block. © Joseph Vera. One of the most important calculations in this project was to check the volume of water in the cylinder block at full capacity (i.e. when the cylinder block is filled with water right up to the top). This volume of water is critical since the weight of the pistons doing the pushing has to be greater than the weight of the water that is being pushed above the water level of the pistons, in order for the pump to function properly. SolidWorks, like most CAD packages, can calculate the volume of components. With the help of SolidWorks, we obtained the volume of the water in the cylinder block by subtracting the volume of the hollowed cylinder block from the volume of a solid version of the cylinder block (see the figure 3 below). We then multiplied the volume of the water by the density of water to obtain the weight. To determine the required weight of the pistons we analyzed a maximum load scenario, which occurs when the cylinder block is full of water and four pistons are pushing the water. We took into account four pistons, because there is a brief moment during the operation of the pump when there are four pistons that are pushing while two pistons are doing the suction. In brief, we ensured that the total weight of four pistons was greater than the weight of the water being pushed when the cylinder block is at full capacity. The expression "the water being pushed" is defined as the water inside of the cylinder block that is above the water level of the pistons. It is interesting to note that Taqi al-Din made the pistons heavier by adding lead weights to them, which actually is a remarkable engineering solution. The lead weights that we modeled were 115 mm in diameter in order to meet this requirement. Figure 3: Water volume calculation. © Joseph Vera. Another important calculation is the flow rate of the pump. First of all, we measured the stroke length of a piston in SolidWorks, which was approximately 120 mm. Then we measured the circular area of a piston, which is 5027 mm2. We multiplied the length by the area to obtain the volume of water being displaced per stroke, which is 603240 mm3. In one camshaft revolution there are 6 strokes; therefore, there are 6 × 603240 mm3 = 3619440 mm3 or approximately 3.62 liters of water displaced per revolution. The flow rate depends on the angular velocity of the camshaft. If we assume that it rotates at 10 rpm (which is realistic for a river flowing at 500 mm/s), the flow rate then becomes 36.2 liters/minute. It is important to note that a linear reciprocating motion (i.e. linear back and forth motion) is required for the pistons to pump the water. How is this reciprocating motion obtained? For starters, a nearby river is used as the source of energy. This energy is captured via a scoop waterwheel which results in a rotary motion. So the challenge that Taqi al-Din faced was to convert this rotary motion to reciprocating motion. This was achieved by connecting a camshaft to the waterwheel. The cams were then equally spaced and lined up with the levers and the pistons. Also, the camshaft was hexagonally shaped and a cam was placed in each of the flat faces of the hexagon in such a way that each cam made contact with a lever at different instances in time. Each cam pushed one end of a lever down, causing the lever to pivot and pull a piston upwards, thereby suctioning the water. Then gravity caused the piston to move downwards and thereby push the water into the main collective pipe. Non-return valves ensured that the water always moved upwards. However, an important question remains: how did Taqi al-Din ensure that the pistons reciprocated linearly? The levers move up and down in an arc path; however, the pistons need to move up and down in a linear path. Although we have no detailed drawings in Taqi al-Din's manuscript, it is quite possible that a pin in the piston rod was connected to a slot in the lever. This mechanism would have converted the arc motion into a linear motion. Note that Taqi al-Din had used pins inside of slots in other pump designs. Below is a drawing generated from SolidWorks showing a possible design for this mechanism with the pin inside of the slot (fig. 4). Figure 4: Slot mechanism converting arc to linear motion. © Joseph Vera. SolidWorks is able to do motion analysis of solids and also do fluid flow analysis; however, it cannot not do both of them at the same time. More specifically, it cannot simulate water pushing a waterwheel, or water being suctioned by a moving piston. To overcome this limitation, we simulated the water pushing the waterwheel by adding a virtual motor in SolidWorks Simulation that rotated the waterwheel at 10 rpm, which -as stated before- is a realistic angular velocity for a river that moves at 500 mm/s. On the other hand, simulating the water in the cylinder block proved to be a challenge, until we realized that the water acted as a spring in the sense that it had a reaction force that was linear to its displacement. Further to this, the water in the cylinder block also acted as a damper that slows down the fall of the pistons. We added virtual springs with damping in SolidWorks to each piston in order to simulate the effect caused by the water in the cylinder block. Below is an image of one of these springs and a link to an animation of this motion simulation (fig.5). Figure 5: Water simulated as a virtual spring. Click here to see the animation. © Joseph Vera. SolidWorks has an add-on that allows one to create photorealistic renderings. In fact when one adds a material in SolidWorks, not only is the appropriate density assigned to the component, but also the texture of the material appears graphically. For the wood in the waterwheel and cylinder block we chose polished pine, since it has a texture that appears to be wet. This makes the pump appear like it has been used and looks more realistic. For the background we chose a dusty setting that resembled the desert, since this pump was likely used in either desert or arid regions. Below is the final rendered image (fig. 6). Taqi al-Din and the engineers of the Islamic Golden Age designed several complex and innovative machines. Creating a model and a simulation of the "monobloc" pump gave us an appreciation of the technical challenges that Taqi al-Din must have overcome to complete this design. This appreciation leads me to believe that the engineers of this era had a very strong grasp of kinematics, dynamics and fluid mechanics in order to make these machines workable. It is also very noteworthy that this "monobloc" pump of the 16th century is a remarkable example of a machine that used renewable energy, a topic that is currently of utmost importance. Figure 6: Photorealistic rendering of the "monobloc" pump. © Joseph Vera. Ahmad Y. al-Hassan and Donald R. Hill, Islamic Technology – An Illustrated History. Islamic Technology. An Illustrated History. Paris/Cambridge: UNESCO/ Cambridge University Press, 1986, pp. 49-52. Salim T S Al-Hassani and Mohammed A. Al-Lawati The Six-Cylinder Water Pump of Taqi al-Din: Its Mathematics, Operation and Virtual Design, (published 21 July 2008). Salim al-Hassani, The Machines of Al-Jazari and Taqi al-Din (published 30 December 2004). FSTC: Al-Jazari: 800 Years After: A special folder published 1 February 2008 containing several articles. FSTC: Taqi al-Din Ibn Ma'ruf: A Special Section published 15 July 2008.